Shown here with Vegan Date Caramel Apple Sauce! The waffle maker has been sitting lonely in our cabinet for years. I have given you lots of recipes for lower carb, gluten free pancakes, so it’s time to add waffles to the mix! Just so you know, pretty much any pancake recipe can be used for waffles, but I use a little less liquid for the waffles. 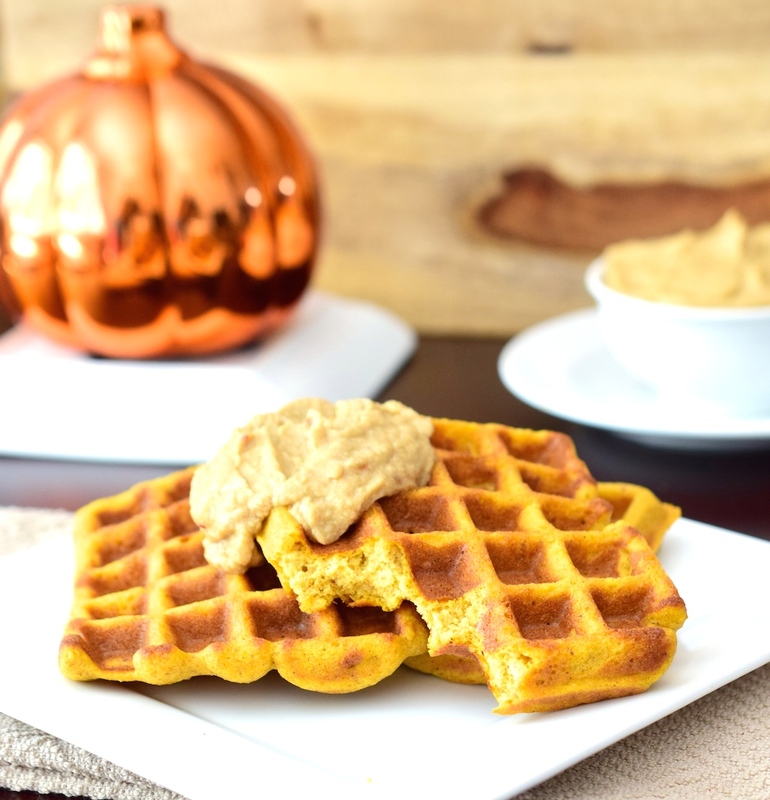 These Gluten Free Pumpkin Waffles are really easy to make, and I’m going to teach you a technique for making quick and easy lower carb baked goods that is especially helpful if you are trying to make a nice breakfast on a busy morning or for a vacation! If this sounds like too many ingredients to pack, or to prepare on a quick morning, mix the dry ingredients beforehand and store them in a bowl or ziploc bag. It’s really easy to just add the wet ingredients, stir, and cook. I play around with the proportions above to create lots of different recipes. In Kauai I made scones with cacao nibs and macadamia nuts in them…scones are dryer than other baked goods, so I used only 1 or 2 eggs and much less liquid. They were delicious! For muffins I would add blueberries or chocolate chips , use only 2 eggs, and probably about a cup of almond milk. When the whole family went to Bass Lake this summer I ran out of coconut oil, so I used sunbutter for the fat in my waffles, and they were a big hit! 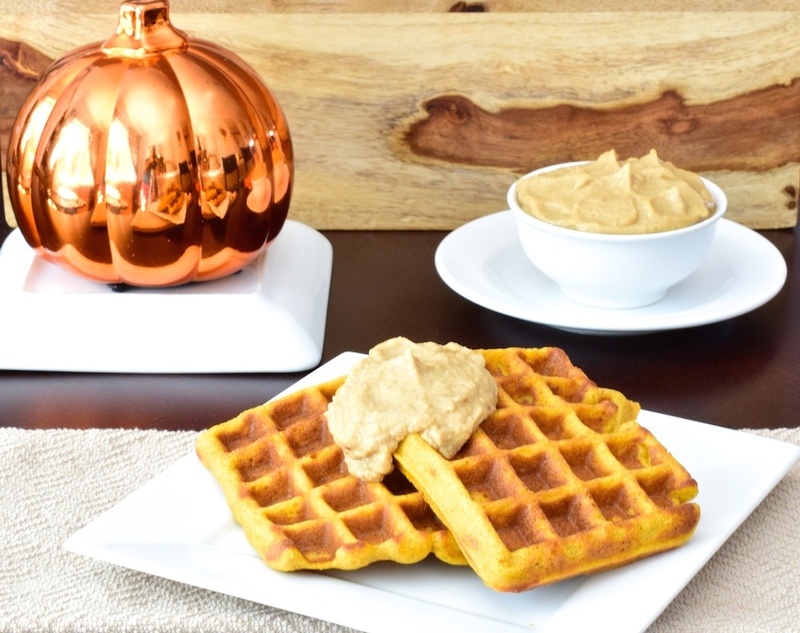 In this recipe for waffles I’ve added pumpkin , which means you only need 1 cup of almond milk. As you can see, there’s a lot you can do with gluten free baking mix and almond flour! Before we get to the recipe for the Gluten Free Pumpkin Waffles, I want to invite you to join with others who are making healthy changes. I’d love to walk alongside you in your journey towards wholeness and health! Jesus said, “I have come that they may have life, and have it to the full!” Freedom from food addictions is part of having a truly full life. 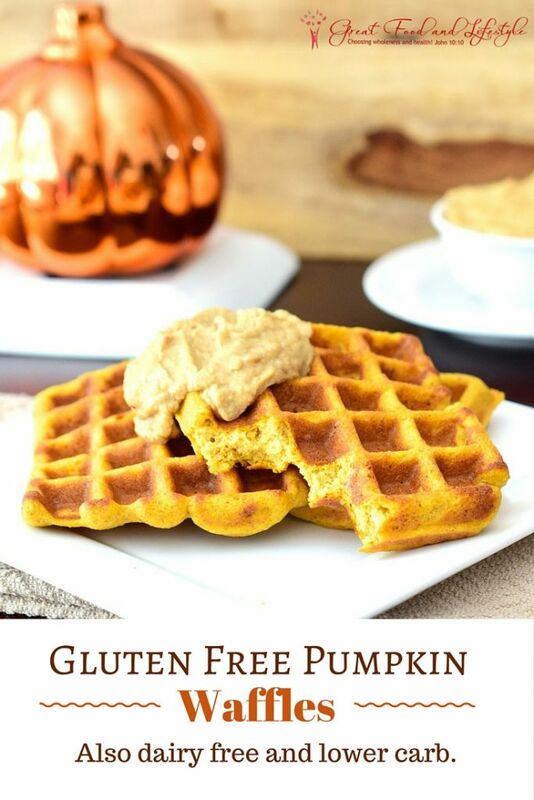 Gluten Free Pumpkin Waffles are a delicious, healthy breakfast! Made with almond flour they're lower carb than most baked goods. Gluten and dairy free. Preheat your waffle iron. Mine does not have temperature settings, you just plug it in. Combine the dry ingredients in a large bowl, and the wet ingredients in a medium bowl. Pour the wet ingredients into the dry and stir them well. Make sure there are no lumps in the batter. Spray your waffle iron with coconut oil and cook according to your machine's instructions. Enjoy! These waffles are super yummy with Vegan Date Caramel Apple Sauce. Click on the link for the recipe!